About halfway between the Nanko Ferry Terminal and Kansai International Airport is the city of Kishiwada, which is famous for the Danjiri Festival with its many colorful floats. When the Hanshin Expressway Public Corporation built a bridge in Kishiwada, they designed it to represent one of the floats. The Kishiwada Bridge is a three-span middle-through arch, which means the deck is in the middle of the arch. The main span is 255 m (837 ft) long and the side spans are 95 m (312 ft) long. The bridge varies from 21.9 m (72 ft) to 27.7 m (91 ft) in width. The arch is supported by cast-in-place concrete piles. 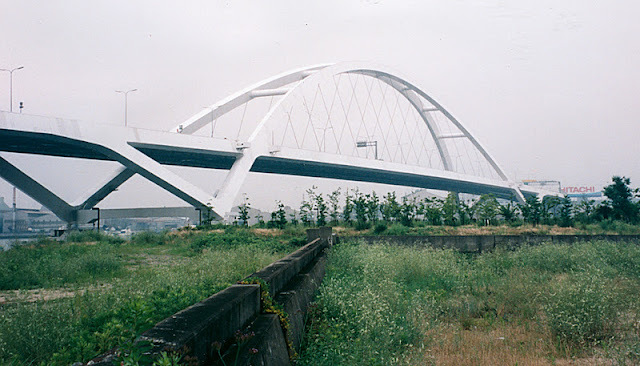 The bridge was completed in 1993 at a cost of 7.3 billion yen (about $73 million). The arch ribs are inclined towards each other (like the handle of a basket) and they support the bridge deck with steel hanger cables. The Wangan Elevated Expressway from Osaka to Kobe has many spectacular arch and cable-stayed bridges along Osaka Bay. Osaka Bay Bridges: Kishiwada Bridge by Mark Yashinsky is licensed under a Creative Commons Attribution-NonCommercial-ShareAlike 3.0 United States License.